While out walking the other day, I spied an older Jeep that looked as if it had been involved in a lot of fun over the weekend. Yes, it is covered in mud! I remember a few years ago Jeremy and Patrick took their Jeeps, which were new at the time to a Jeep weekend near Ocean City. We had a blast and their Jeeps looked very similar to the one on the street the other day after the weekend of riding through mud pits and traversing an obstacle course. Unlike my neighbor, however, we took those Jeeps to a car wash to remove the layers of mud. 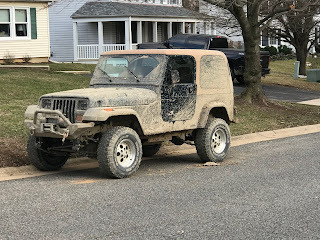 My neighbor washed his Jeep in his driveway yesterday. I am convinced the mud that came off the Jeep will be slowly going making its way down the street and into the storm sewer system that runs near my backyard for a very long time. There is something freeing about getting out and doing some mudding!